A new report shows how many young people found jobs and the industries where they worked. As summer comes to a close, many young Americans are wrapping up temporary jobs and heading back to the classroom. Each year, numbers of students and recent graduates looking for work jumps in the summer months, typically peaking in July. The Labor Department’s annual report on summer youth employment publishes data showing how many young Americans work and where they’re finding summer jobs. The updated estimates released Tuesday suggest mostly marginal improvements over last year. The unemployment rate for the age 16-to-24 population was 12.2 percent in July, down from 14.3 percent last year and 16.3 percent in 2013. Labor force participation, which considers both people working and looking for work, changed very little. Shares of young adults working paid jobs during the summer has ticked up a bit in recent years after plummeting during the recession. 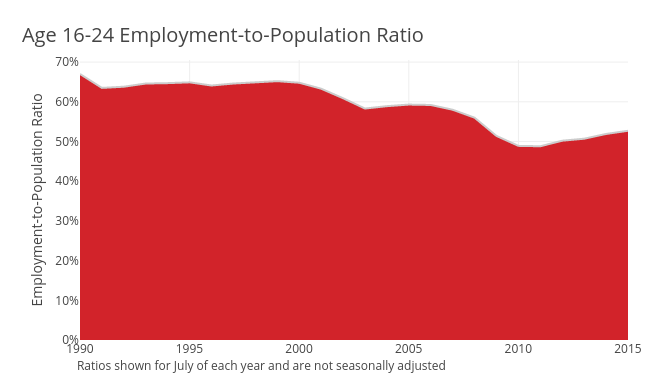 Still, though, the employment-to-population ratio for this segment of the population remains well below recorded levels in the 1990s and early 2000s. A slightly higher percentage of young men were working in July than women, although their unemployment rate was also higher. Estimates further vary across racial and ethnic groups. Most notably, the July unemployment rate for young blacks was 20.7 percent, essentially double the rate for whites. Many of these younger job seekers live in urban areas where there aren’t nearly enough jobs to meet the large demand, so city leaders have sought ways to provide more opportunities. Earlier this year, Philadelphia Mayor Michael Nutter called on local employers to create 10,000 summer jobs. In Baltimore, a public-private partnership expanded its efforts to provide roughly 8,000 youth with paid positions. Many young adults find work in low-wage sectors of the economy. Nearly half (46 percent) of paid workers ages 16 to 24 worked in retail or the leisure and hospitality industry. Young adults in the Labor Department survey make up a mix of workers at various stages in their careers. Many are recent college graduates or full-time employees without college degrees, while others hold internships or other temporary positions. Estimates don’t reflect unpaid interns unless they’re working for a family business. Some industries saw employment among young adults fluctuate up or down this summer. Interestingly, data suggests a sizable increase in youth employment for local governments, up 16 percent from last July.